L. Gene Black, former professor, dean of music and longtime director of the A Cappella Choir at Samford University, died on Wednesday, Feb. 25. He was 80. Black retired in 2000 after a 35-year career at Samford. As choir director, he led singers on 30 international concert tours to Asia, the United Kingdom, Scandinavia and Europe. Under his direction, the choir performed on stages in European cathedrals, the White House and hundreds of churches in the U.S. and abroad. 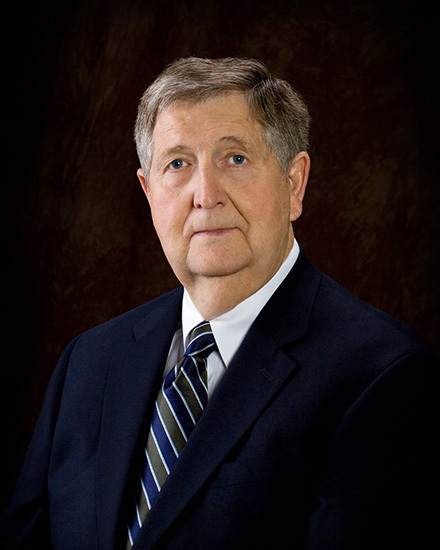 He joined the Samford faculty in 1965 as assistant choir director, and became director in 1966, a post he continued after being named dean of the school of music (now School of the Arts) in 1980. A 1959 Samford graduate, Black once noted that he had enrolled at the school to sing in the choir, which he had first heard perform at his childhood church, Central Baptist in Decatur, Alabama. He earned master’s degrees in music education and secondary education and a Ph.D. in higher education from the University of Alabama. He also studied choral music and conducting at Florida State University and Columbia University. Through the years, Black served as minister of music at several Birmingham area churches. In 1992, he helped form the A Cappella Alumni Choir, which he led on concert tours to Germany and England. A highlight was the alumni choir’s 1994 performance in the newly rebuilt Berliner Dom—the venue’s first concert season since the end of World War II. Black was a member of Phi Mu Alpha Sinfonia men’s music fraternity, Phi Delta Kappa education society, Pi Kappa Lambda music education honor society, Kappa Delta Phi fraternity and state and national choral and music education associations. In 2008, he was inducted as a member of the inaugural class of the Alabama Music Educators Hall of Fame. That year at Samford Homecoming, he was honored with a special concert and tribute program that recognized his life as a musician, educator and Christian. He is survived by his wife, Faye Hamilton Black, daughter, Gina Black Clay, and three grandchildren, Ethan, Emma Kate and Elijah. A celebration of life service will be held at 11 a.m. on Saturday, March 7, at Dawson Memorial Baptist Church in Homewood, Alabama. A reception will follow.